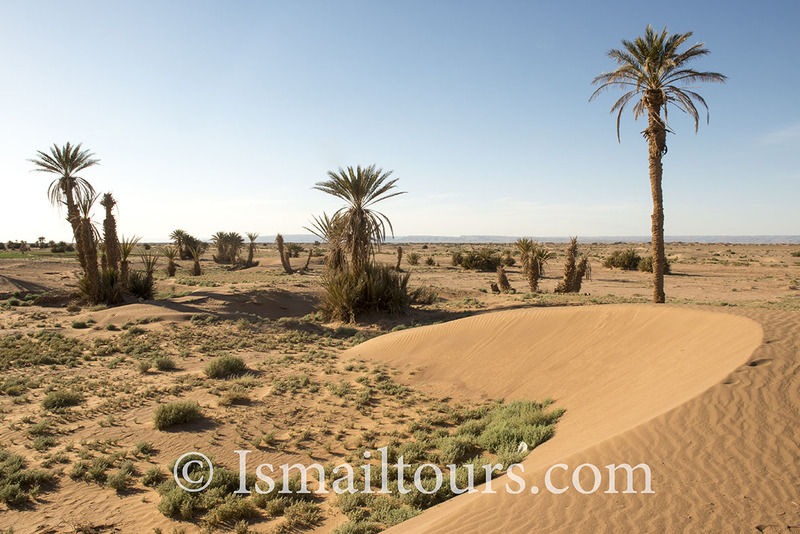 South of Ouarzazate, past the last foothills of the anti-Atlas mountains begins the vast desert plateau of the Draa. 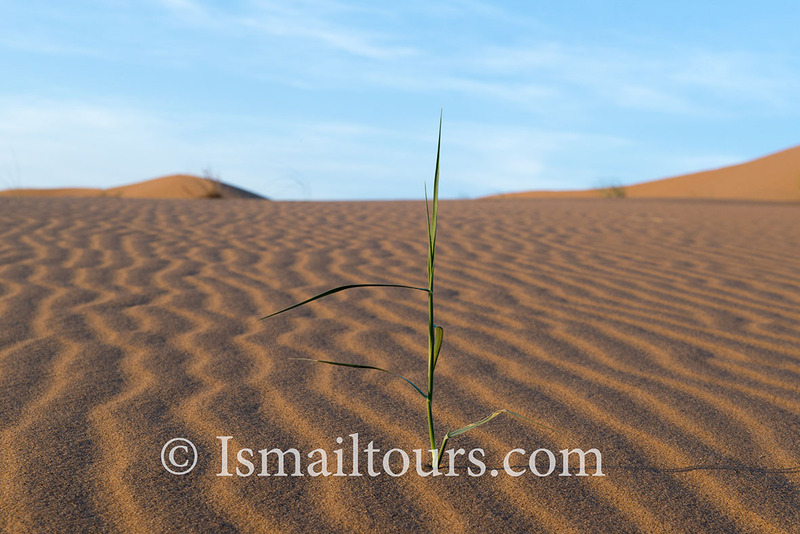 The river bed of the Draa is more than 700 km long leading to the Atlantic Ocean. 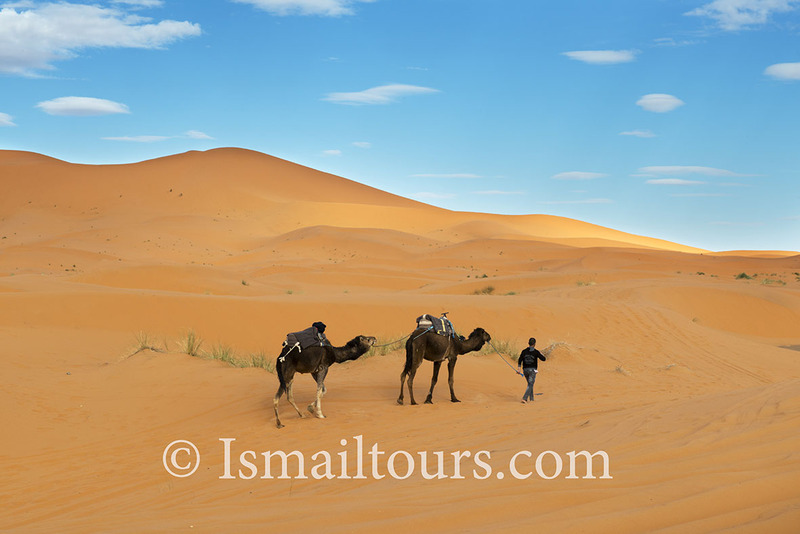 This river forms the northern boundary of the Sahara and in ancient times it was Morocco’s longest river. 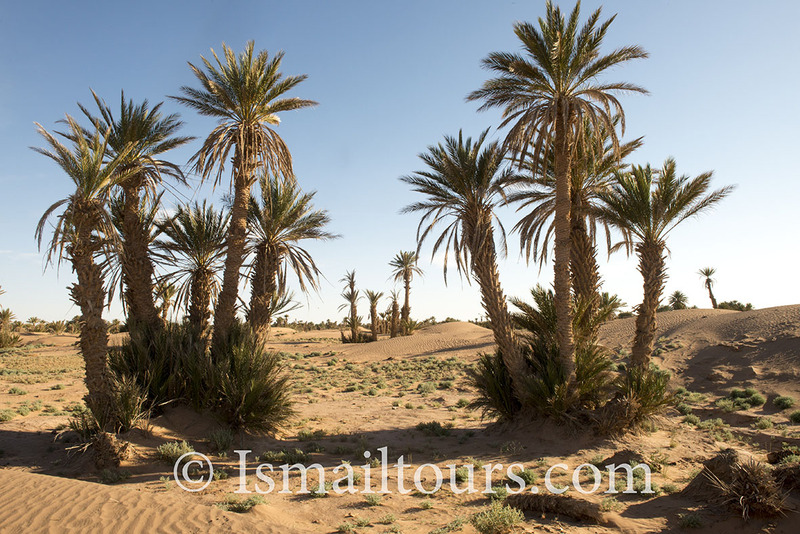 Today the water of the Draa is giving nutrition to a beautiful ribbon of palm gardens, stretching down to Mhamid before disappearing in the sand. The most beautiful landscapes are found beyond Mahmid. 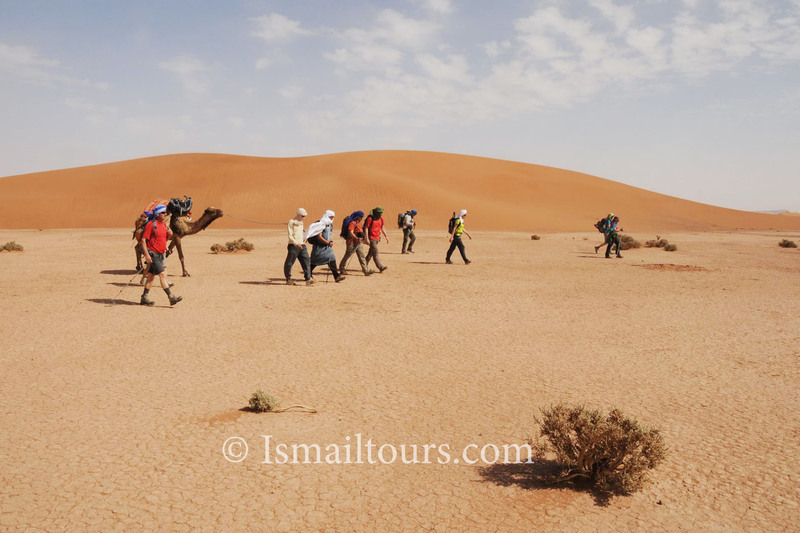 During our cameltrekking we will journey through this beautiful landscape of dunes, dried-up lakes, and secluded oases, frequented by nomads with their camels. You will fully discover this part of the country. 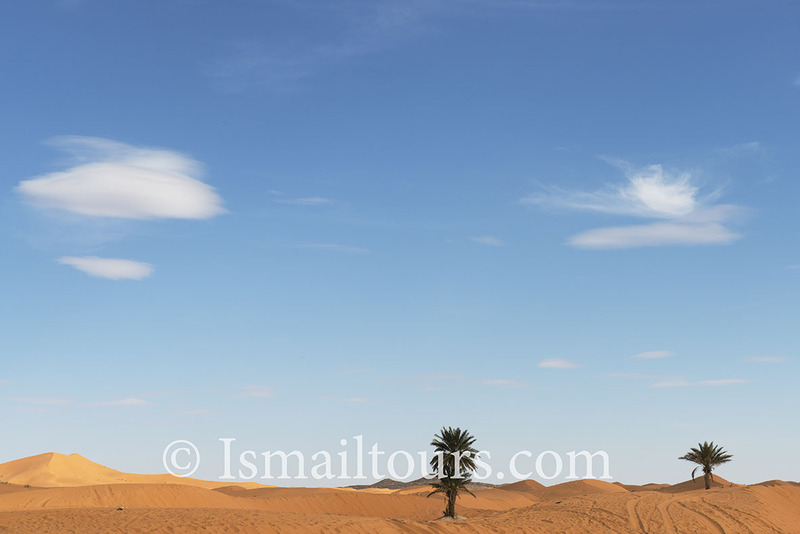 An amazing trip in the unexpected landscape of the desert. Departure by international flight to Marrakesh. After arriving at the airport you are welcomed by our guide and brought to your accommodation. You will stay in a beautiful riad, which is located right in the old Medina. 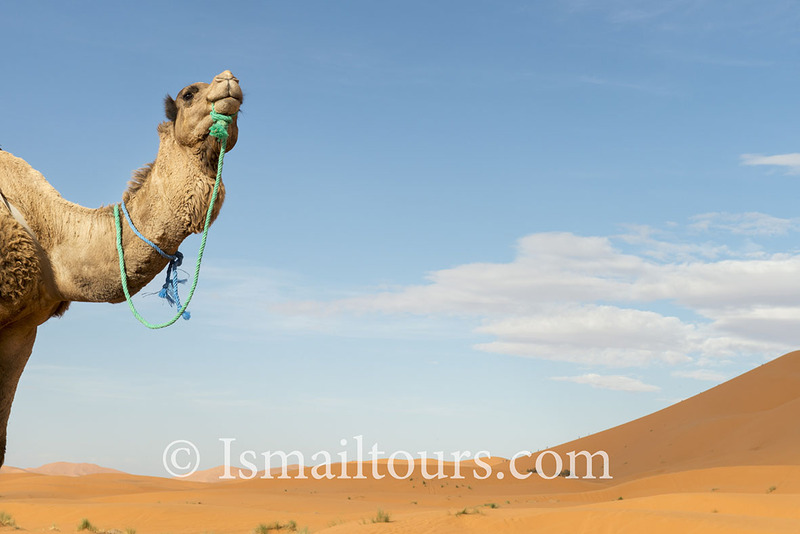 In the evening we will visit the Jemaa el Fna. This world-famous market transforms each night into an outdoor restaurant and all sort of things are sold and displayed. This ‘square of death’ , once offered a different kind of spectacle, in the form of public executions after which the heads of the victims were displayed on poles. We will stay in a riad, based on bed and breakfast. After breakfast we depart and travel across the Tizi n ‘ Tichka pass to the South. The Tizi n Tichka ‘ is a modern road, which connects Marrakesh with the desert areas in the south-east. The highest point, the Tizi n ‘ Tichka pass is located at 2260 meters. The road takes us across the High Atlas mountains and offers great views over the mountains and valleys. 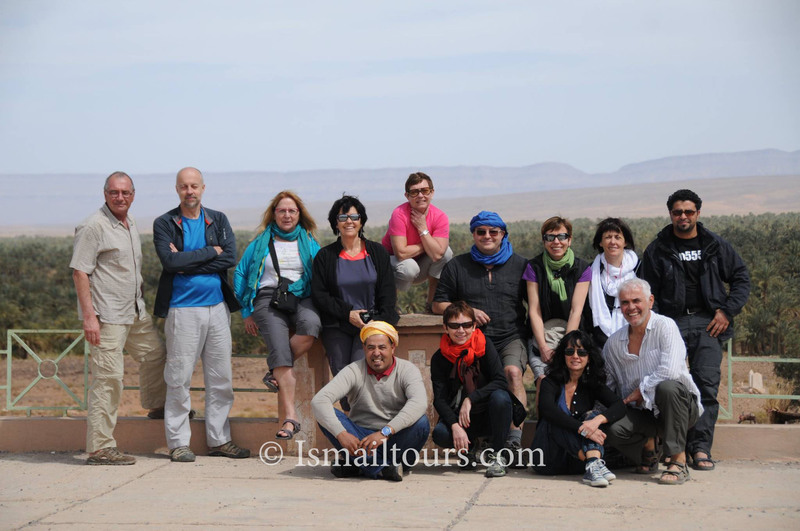 We will visit the Kasbah of Talouet and pass numerous local villages. South of the pass we will come across Ait Ben Haddou, featuring a spectacular collection of kasbahs. 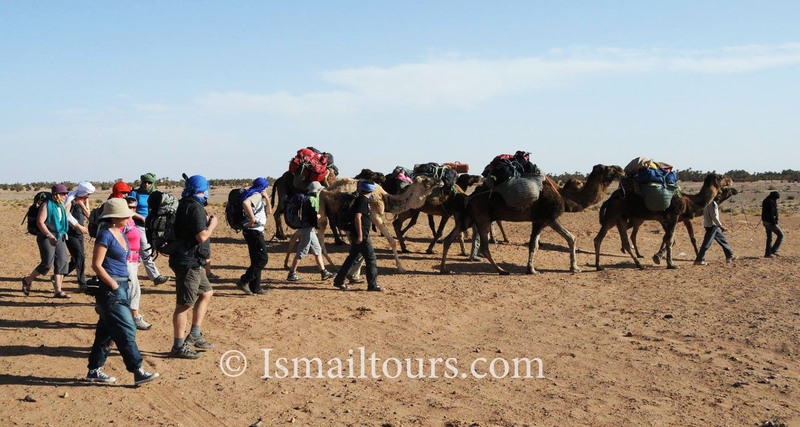 We will explore the kasbah complex and climb to the Agadir (fortified grain repository), from which we have a beautiful view over the Valley. It is an UNESCO site. Afterwards we will drive to a beautiful kasbah, where we will spend the night. Day 3 – Mahmid – race Nkhel Tamdagt. 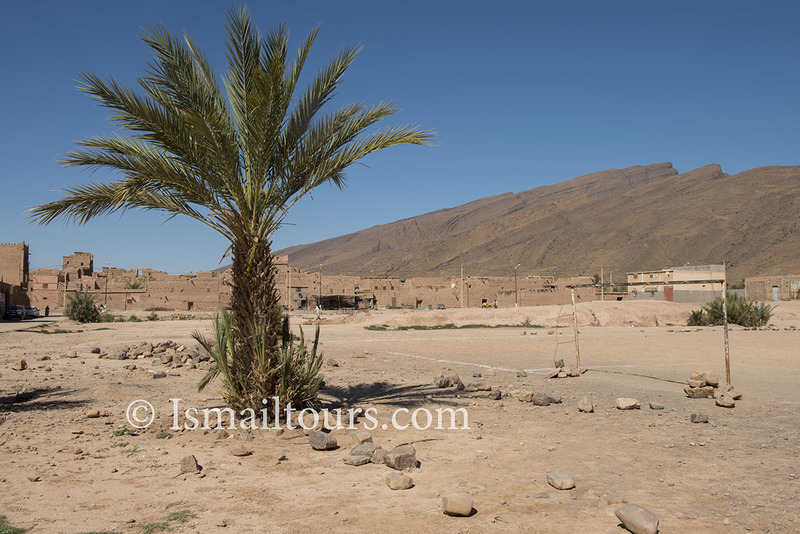 After breakfast we will continue our journey to the south, towards Ouarzarzate. The road leads us through the beautiful valley of the Draa, a large Moroccan river that wells up in the Atlas mountains. 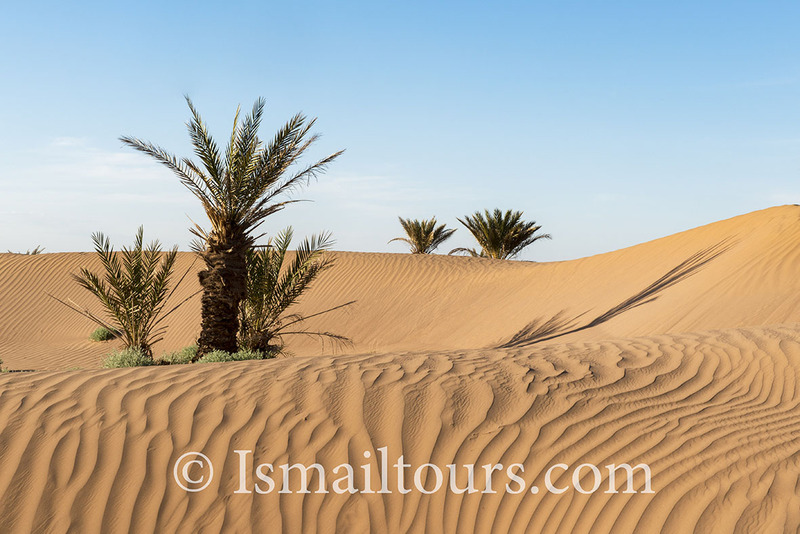 We’re going to view magnificent kasbahs and vast areas with date palms. We will pass Agdz, Zagora, Tago unit, Oulad Driss and finally we will reach Mhamid, where we will meet our crew. 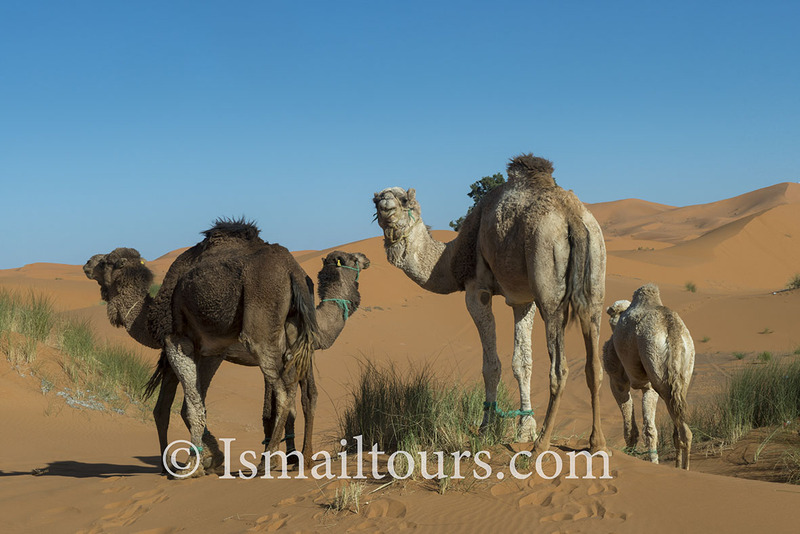 Once all the baggage is packed on the dromedaries, we will depart on our first walk. We will cross the oued (dry riverbed) of the Draa and walk to the end of the palm grove (race Nkhel), where we will set up our encampment. As we still have some time left before sunset, we can take a walk in the surroundings of this beautiful spot. After breakfast we will depart the inhabited world. 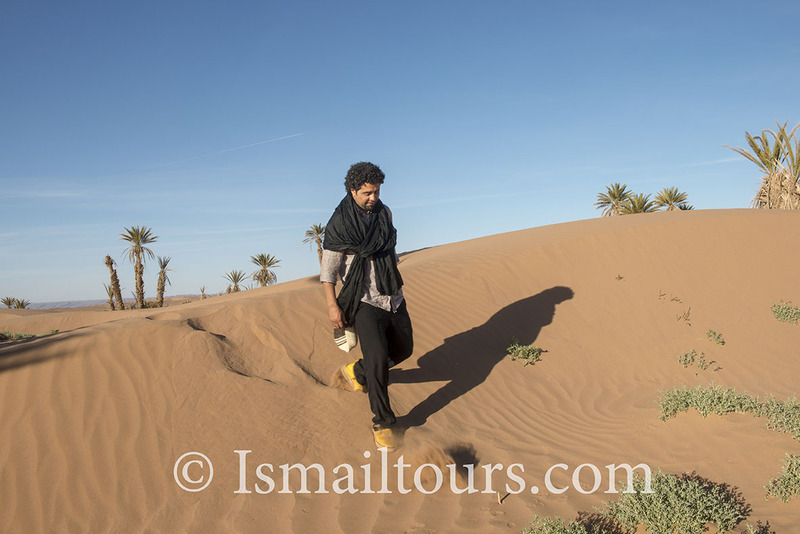 We will walk through a forest of tamarinds-trees, situated along the river bed of the Draa. 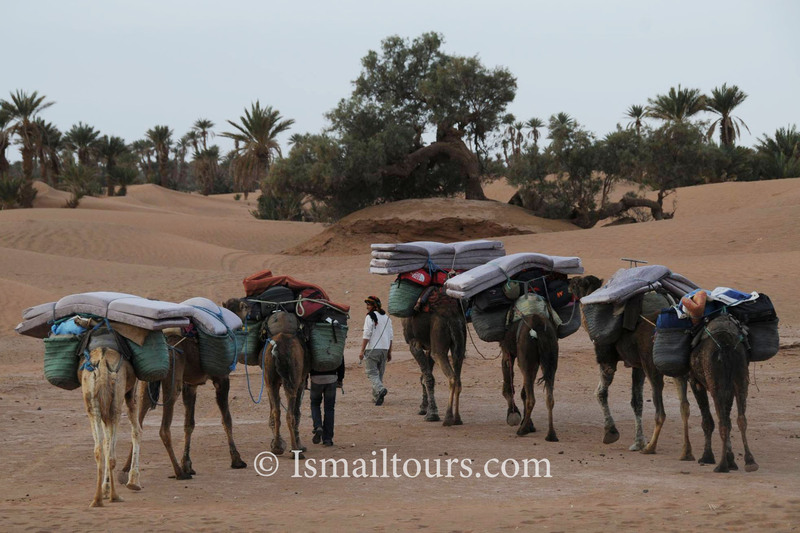 We will cross the plateau of Sidi N over and set up our encampment near the marabout (= wise man) of Sidi Naji. Duration: 4.5 hours. 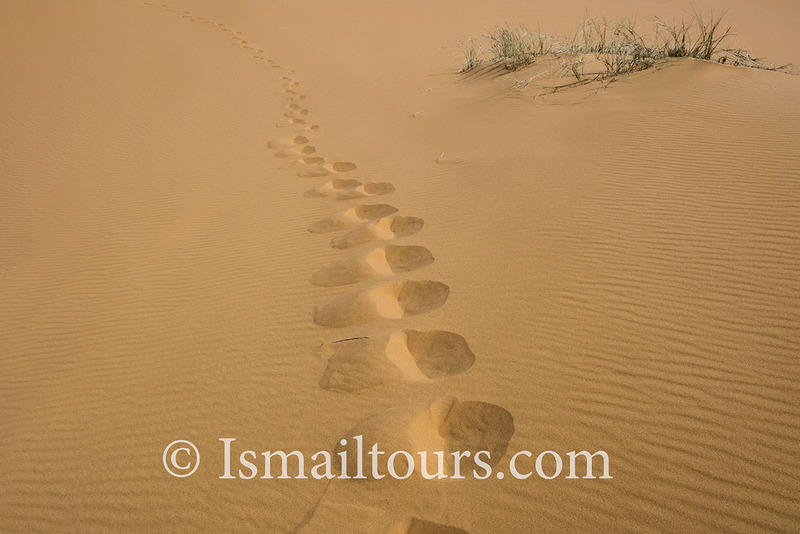 After breakfast we will walk to the west and travel deeper into the great desert. 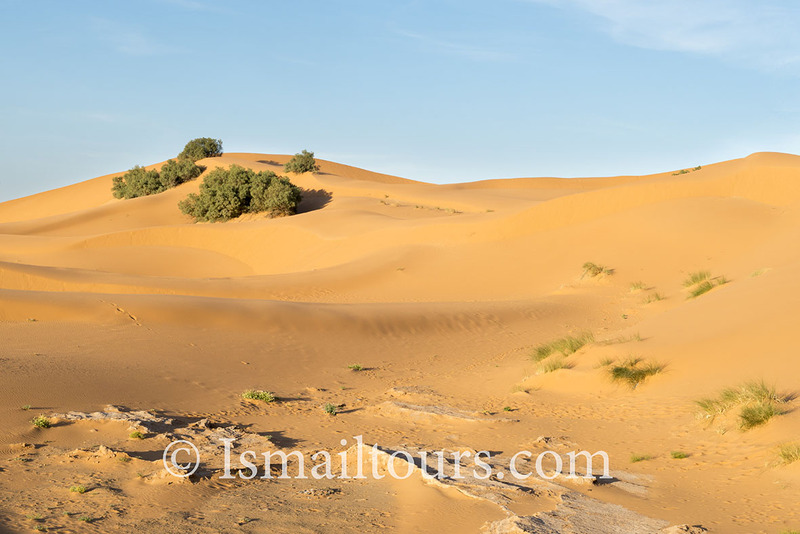 The tamarinds-trees disappear slowly, dunes fill the landscape and after 5 hours of walking we will reach the erg (dunes sea) of Zaher, our camping spot. After breakfast we will travel north and then back to the west. 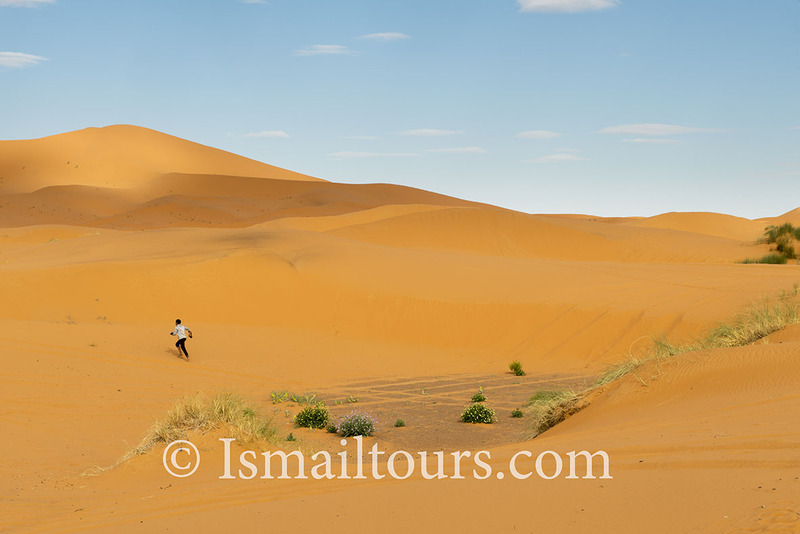 We will cross the dry riverbed of the Draa, a surface of sand and boulders. We will pass an abandoned village, named El Bloc where traces of irrigation culture can still be found. 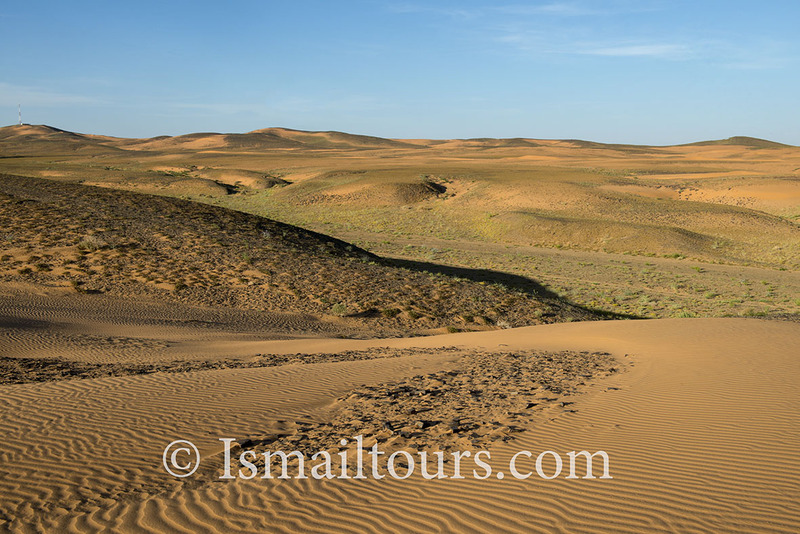 At the end of our walking trek (5 hours walking) we will reach the Sedrat, where we will set up our encampment in the middle of the dunes. 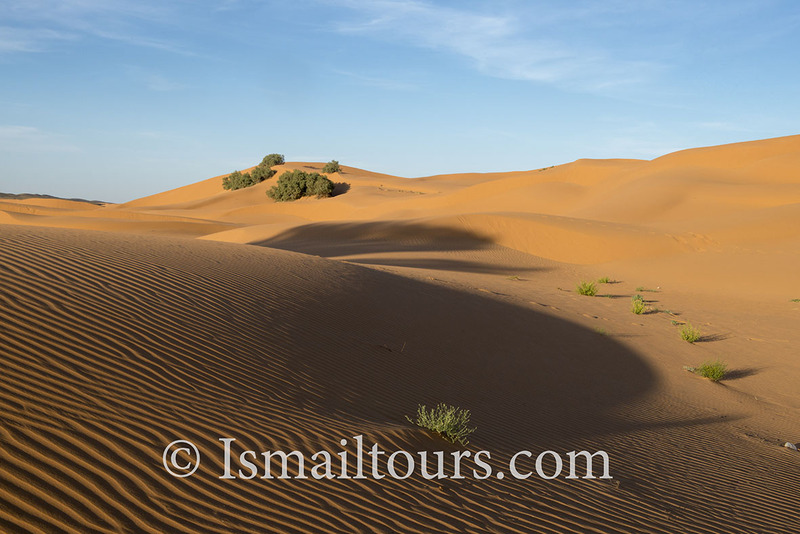 We are now in the middle of the great Sahara, overall around us there are dunes, stretches as far as the eye. The hamada (rock plateau in a wilderness area) of the Draa and the Jbel (mountain) Bani determine on the horizon the landscape, of many colors. 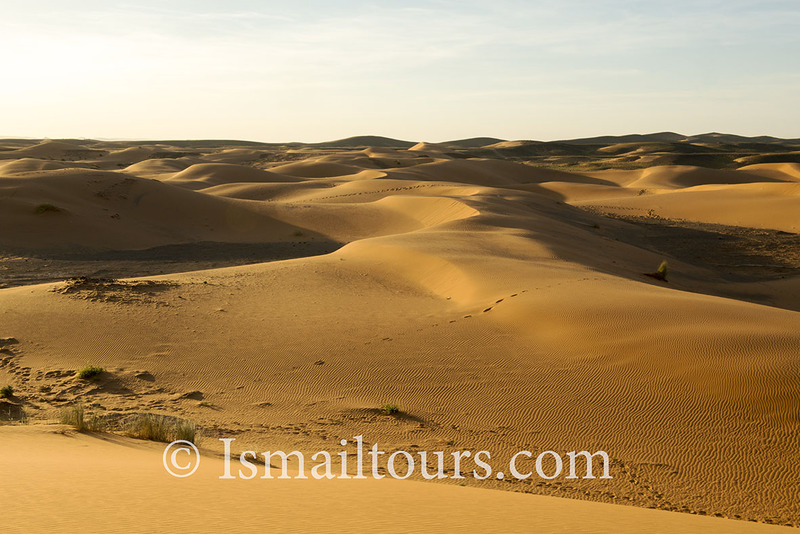 The dunes of Chgaga forms our bivouac place for tonight. 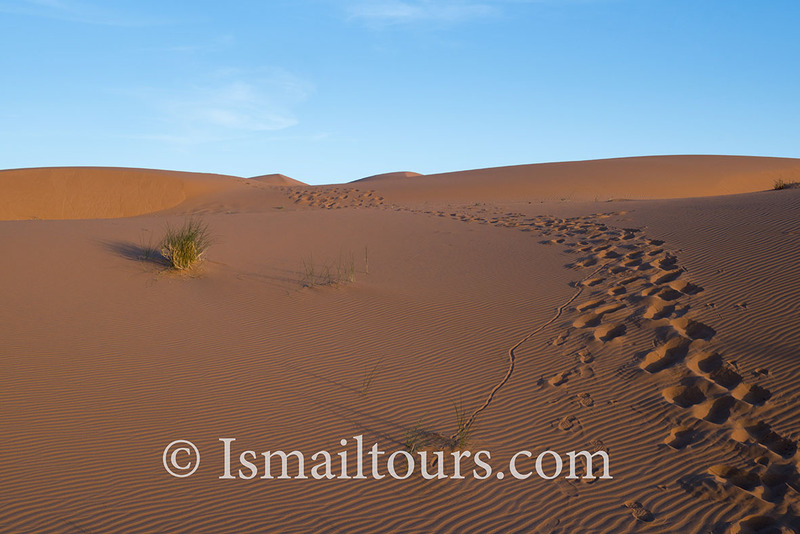 At the end of the afternoon, we will climb the highest Dune, called Abidlia, to enjoy the sunset. Overnight: camping on the basis of full board. 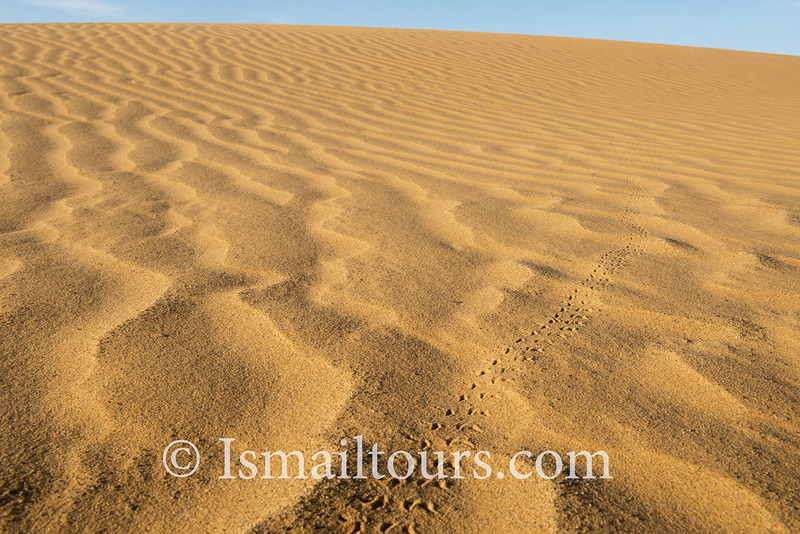 In the slow rhythm of the dromedaries we will pass the dunes area of Chgaga. 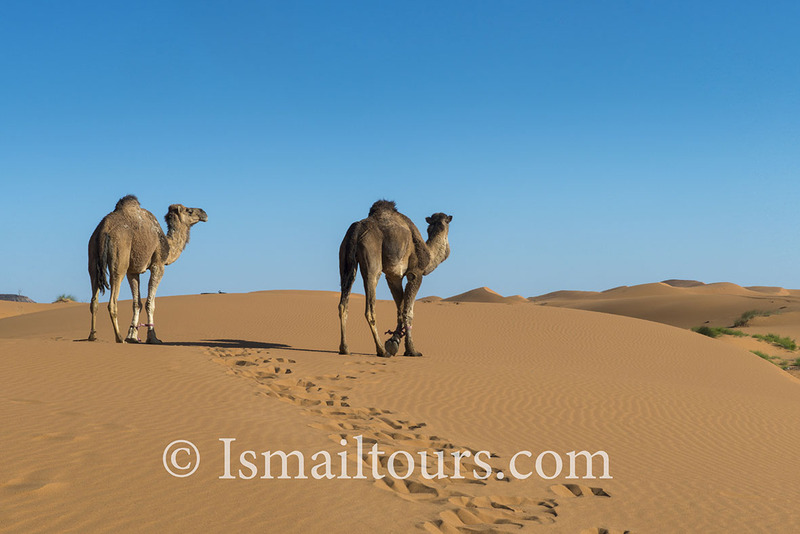 There is a high probability of meeting nomads, who stay here in their bedouin tents. 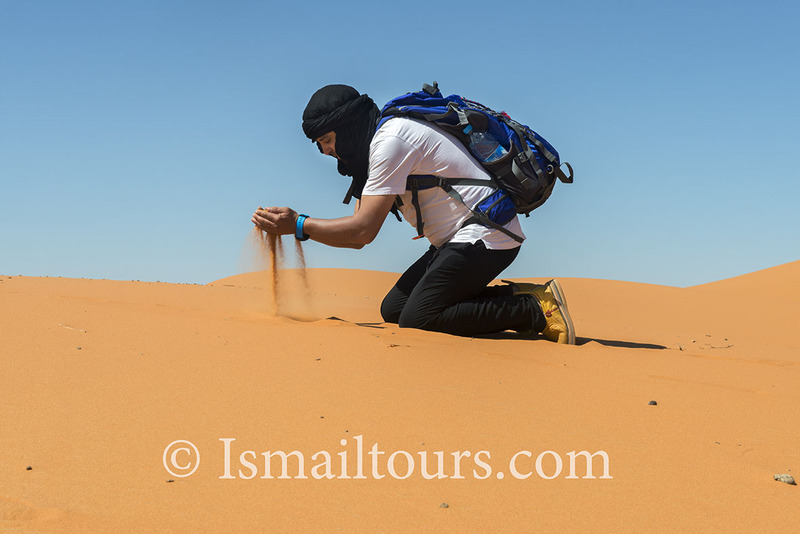 Finally we will reach the beautiful dunes of the erg Ighoul, where we will set up our encampment for the last time in the surroundings of the dunes. 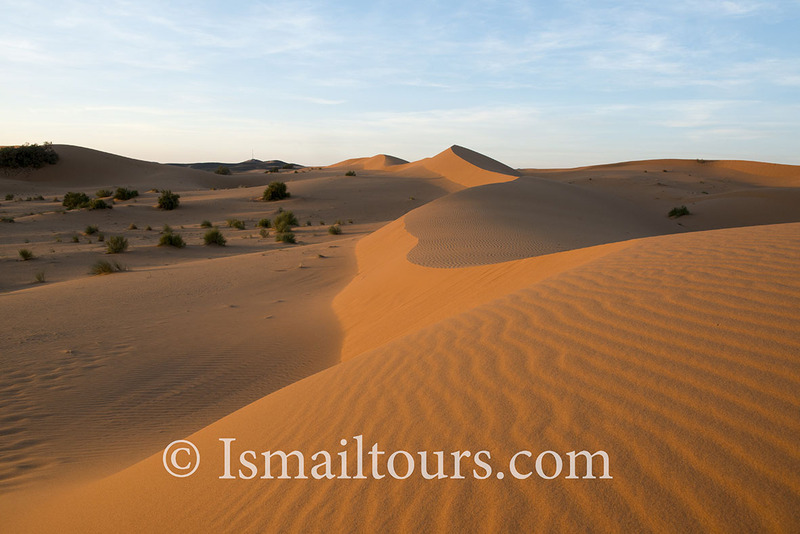 You will enjoy the sunset on the highest dune. Walking time: 5 hours. 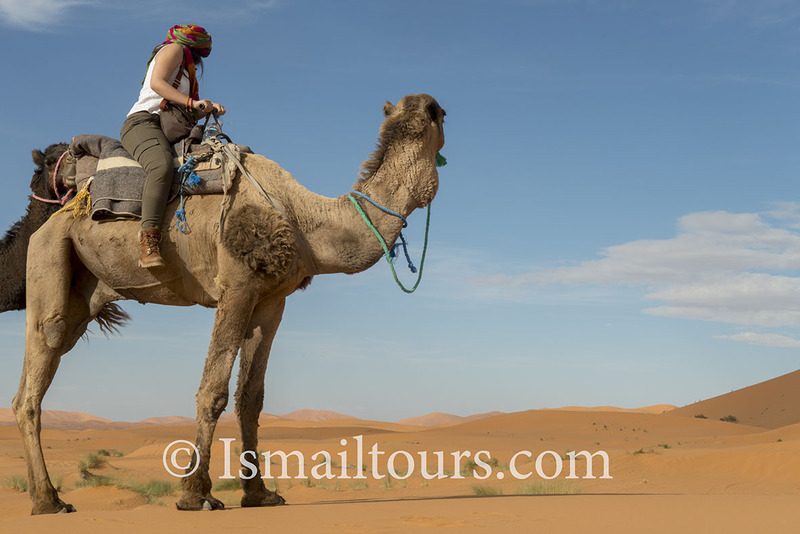 Day 9 Tazenakht – Marrakesh. After breakfast it is time to say goodbye to the crew. Our luggage is loaded into cars and we continue our trip. 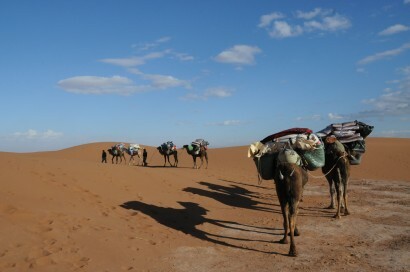 We will cross the great plateau road for 90 km and follow Iriqi, which runs along the Algerian border. We will drive through the beautiful valley of Foum Zguid. In the afternoon we have will lunch in a small restaurant in the town of Tazenakht. After lunch, we will cross the Tizi n’Tichkapas and drive back to Marrakesh, where we will stay in a riad. You will have the opportunity to explore this ‘red’ city from the eleventh century. The nickname refers to the many terracotta-colored buildings that look red in the glow of the setting sun. 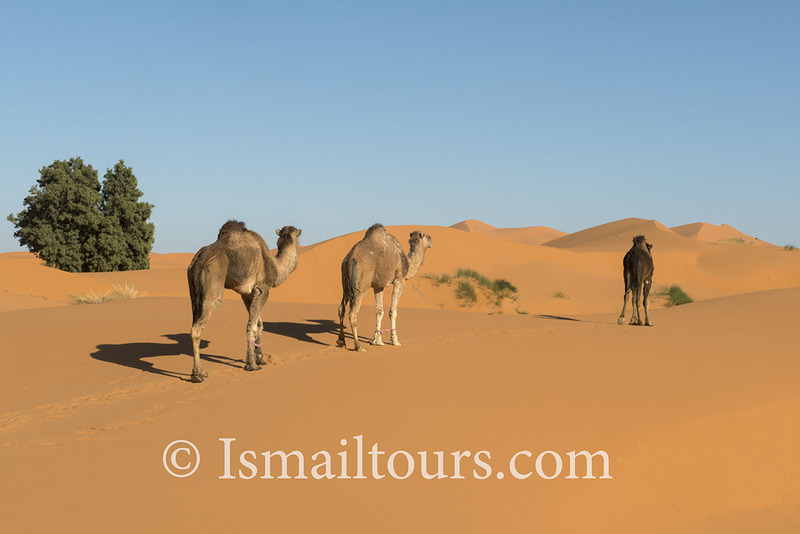 There are many attractions such as the Museum of Marrakesh, the Koranic school, the Koutoubia Mosque, the Bahia and Badi Palace, the Gueliz district, featuring luxurious shopping opportunities and the tombs of the Saadiërs, the Menara gardens. A highlight is the garden of Majorelle, belonging to the fashion king Yves Saint Laurent. You should see the many souks (covered markets) and the Jemaa el Fna by day. Overnight: riad, based on bed and breakfast. Return flight to Europe. Our guide will drop you at the airport on time. Here we will have to say our goodbyes.